This rare and interesting name is of Medieval English origin and was claimed in earlier research to be a dialectal variant of the locational name 'Harborough', translating as 'the hill where oats were grown'. This may be so as early recordings are intermixed and overlap between Aborrow, Aburrow and Harborowe as examples. However we are also inclined to believe that the name in some instances may also derive from one of the many places called 'Barrow' in England, or it may have described one who lived at an ancient barrow. The list of potential places includes Great Barrow in Cheshire, Barrow upon Trent, recorded as Baruue' in the 1086 Domesday Book, but our selection would be Barrow upon Humber, recorded in 730 a.d by the Venerable Bede as 'Aet Bearewe' (at the barrow). These names have the same meaning of 'a wood or grove', not a burial spot, although apparently Barrow in Leicestershire recorded as 'Berc' in 1206, does mean the 'mound'. The surname would seem to have developed during the late medieval period, when many tenants lost their common grazing rights, and were then forced to seek work elsewhere. They took or were given, as easy identification, the name of their former home, or an approximation of the spelling. 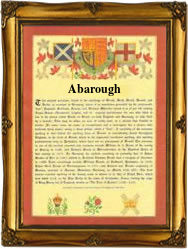 In this case early examples include Margaret Aborowe who married Will Thomas at St Margarets, Westminster, on May 13th 1542, William A'Barrow married Mary Hunt on July 2nd 1649 at Knightsbridge, and Charles Abarough, or Arbarough, christened at St. Martins in the Field, Westminster, on April 30th 1710. The first recorded spelling of the family name is shown to be that of Adam Hareborogh, which was dated 1273, recorded in the rolls known as 'Kirby's Quest', Somerset, during the reign of King Edward 1st, known as 'The hammer of the Scots', 1272 - 1307. Surnames became necessary when governments introduced personal taxation. In England this was known as Poll Tax. Throughout the centuries, surnames in every country have continued to "develop" often leading to astonishing variants of the original spelling. Enjoy this name printed onto our colourful scroll, printed in Olde English script. An ideal gift. Subscribe to the SurnameDB Newsletter and recieve our fortnightly updates on top family history and genealogy news and tips, delivered straight to your inbox. © 2017 Name Origin Research. All rights reserved.